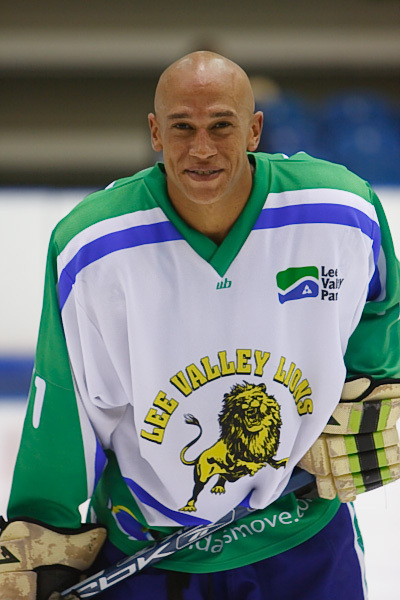 The Lee Valley Lions can announce the next returnee to their roster for the 2018-19 season, as veteran forward Nicky Brathwaite comes back to the club after eight seasons away. Leyton-born Brathwaite started his career with the original Lions way back in 1993, playing the final two seasons of the club’s existence in the old British Division 1 before the club folded in 1995. During this time he played 41 games, scoring one assist. He then spent two seasons at Haringey in 1997-98 and 2004-05, after which he returned to the Lions when the club reformed in 2005. He played the 2005-06 and 2006-07 seasons with the Lions, playing a total of 34 games and scoring ten points (three goals and seven assists). Nicky also played three games with the Lions at the start of the 2009-10 season before moving to the Romford Fury, where he spent the last two seasons of his career to date. The wily veteran now returns to league hockey after seven years out of the game, and will hope to use his experience to help a new-look Lions squad move forward. Click here to view Nicky’s career statistics courtesy of eliteprospects.com. Veteran forward Nicky Brathwaite returns to the club after eight seasons away.